The kid-friendly Nabi tablets like DreamTab HD8, JR, XD, Nabi 2, etc. provide a powerful suite of creative tools that teach your children how to draw, animate, author their own books like a pro. Meanwhile, the Nabi products have make a great contribution on multimedia enjoyment especially for watching movies. If you've bought some DVDs for your Kids, you can consider copying DVD movies to Nabi tablet so that you Kids can watch their favorite movies with ease. However, whether tried by Nabi DreamTab HD8, JR, or XD, Nabi 2, it's failed to play DVD movies directly. The reason is that Nabi tablet doesn't have a built-in DVD-ROM or DVD player. According to Nabi official website, the Nabi tablet supports MPEG-4, H.263, H.264 etc. videos. 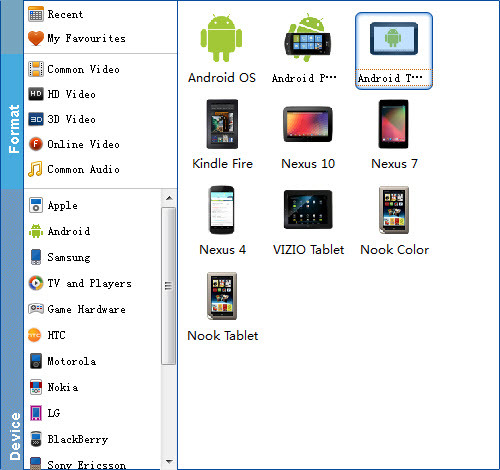 To play DVD movies on Nabi tablet, you will need to rip DVD to Nabi tablet supported format first. In fact, it is easy to watch DVD videos on Nabi tablet as long as you got a DVD Ripper in hand. This article will tell you how to convert DVD to Nabi devices playable video formats so that you can enjoy your favorite DVD movies on the go. The recommended DVD to Nabi converter is EaseFab best DVD riping software. It can professionally rip DVD to Nabi DreamTab HD8, JR or XD, Nabi 2 supported video formats with fast speed and excellent output quality. In addition, this DVD ripping tool can also convert DVD to various popular video formats like AVI, MP4, WMV, MPEG, MOV, FLV, MKV, 3GP, etc. as well as rip DVD to optimized video for playback on iPad, iPod, iPhone, Zune, Creative Zen, Archos, iRiver, Blackberry, Xbox 360 and more. Now download the program and follow the tips below to finish your task. Converting DVD to Nabi tablet with EaseFab DVD Ripper is simple as ABC. After downloading, follow the wizard to install and run the program. Then follow the steps below to rip DVD to Nabi devices playable videos in a few clicks! The below guide takes DVD Ripper for Windows (Windows 8 compatible) screenshots for example. Insert the DVD disc into your computer's DVD drive and click the "Load DVD" button on the top left to select and load the DVD movies you want to play on your Nabi tablets. ISO and IFO files are also supported. After the movies are loaded, you can preview them on the right viewing window and adjust volume or take snapshots freely. Just click "Profile" and select Android Tablet model from Android category to get videos with optimized settings for playing on Nabi DreamTab, JR, XD or Nabi 2. Tips: If you're not satisfied with the result videos. You can click the Settings button beside Profile to set bitrate, frame rate, codec, channels, sample rate, etc to adjust parameters that affect video quality and file size for the video you prefer. After that, you can click on "Add to My Favourites" to rename the profile, such as "Nabi Tablet". Next time, you can easily find it in "My Favourites" category. When you have finished all the above settings, you can simply click the Convert button on the main interface and let the software do the DVD to Nabi MP4 conversion for you. After the conversion, click "Open" to locate the converted video files and then transfer them to your DreamTab HD8, JR, XD or Nabi 2 for watching on the go with ease.